* About the Materials used: The clear acrylic center (1/4" thick) has high sheen and engraves "white". The attached Rosewood piano finish frame holds the acrylic plaque and has a high gloss mirror finish with a gold metal inlay on the sides. The completed award measures (11 X 8 1/2"). 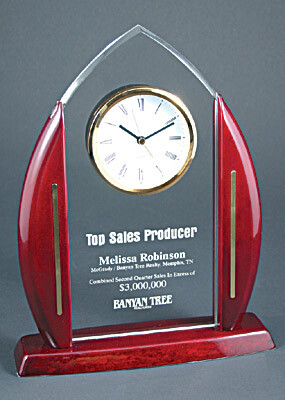 Comes complete with functional clock, engraving and assembly..